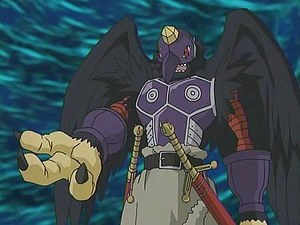 A Demon Man Digimon which has an appearance like a Shugenja. 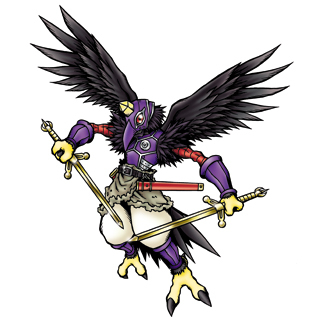 It is a follower of the Daitengu Digimon, and its face is the epitome of a crow. It excels in Shugendo, and freely manipulates its Genriki. 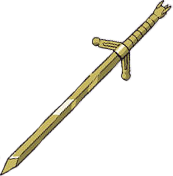 The two swords that Karatenmon possesses are called the "Irataka no Ken", and contain strong magical powers. Its Signature Move, "Satori", consists of readings the opponent's spirit to anticipate their attacks. 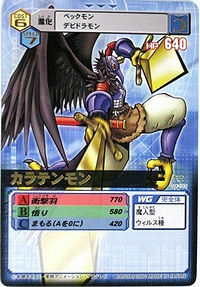 Its Special Move is flapping its jet black wings, driving its feathers into the opponent with a shock wave (Shougekiha). Karatenmon was adopted from a winning Digimon entry in the "Digimon Web Dot-art Contest" which belonged to Mr. Masaki Shima from Ibaraki prefecture. 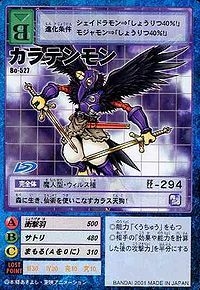 From Karasu-tengu 「烏天狗（カラステング）」, a type of humanoid crow youkai in Japanese mythology. 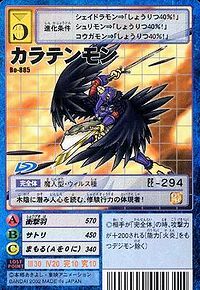 Shōgekiha  Ballistic Feathers 衝撃羽 N/A Feather Flare/Shogekiha Flaps its jet black wings, driving its feathers into the opponent with a shock wave. Reads the opponent's spirit to anticipate their attacks. Irataka no Ken [N 2] Irataka Swords 伊由太加の剣 N/A Harmony Swords/Iyukusaka Sword Attacks or blocks with its swords. Was one of the guardians of an area inside Sephirothmon. He battled against Kouji. He was able to see inside Kouji's heart and saw his weakness in that he was uncertain about his family condition because of his fathers divorce and remarriage. He beat up on Kouji as Wolfmon for a bit until Kouji evolved into Garmmon. Karatenmon fell to Garmmon but the uncertainty felt by his words remained. 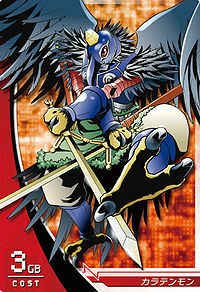 Several Karatenmon were members of The Goddess' Warriors, a Digimon order that lived in Sand Zone. A different Karatenmon was also guarding Shinobi Zone's code crown. 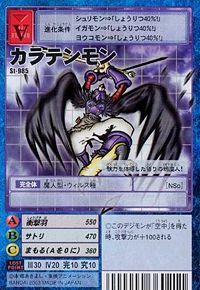 Can be evolved from Sabirdramon if above level 33 and spirit 170, or can be found at Chaos Brain. In Sunburst, you can choose Karatenmon in the beginning alongside with Coronamon and Reppamon if you choose Oriental (Wafuu) Pack. Also in the same version, if you place a cool Karatenmon in player's Farm Island, it will give you a quest mission to bring back its Yamabushi Sword from Pharaohmon at Thriller Ruins. Karatenmon is available as a Digimon Medal. Karatenmon is an enemy Digimon in Area 6. 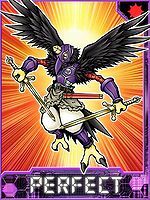 This enlightened demon crow-man has attained Genriki! This karasu-tengu lives in the forest, perfecting its use of its divine abilities! 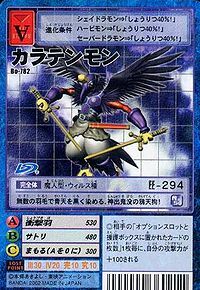 This karasu-tengu appears out of nowhere, dyeing the blue skies black with its countless feathers! A reader of human hearts who lurks amongst the trees, a practitioner of Shugendō! 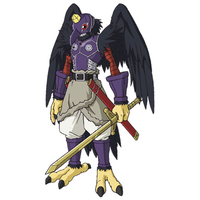 A Demon Man Digimon whose appearance resembles a Shugenja. It is subordinate to a great Tengu Digimon, and even has the face of a crow. ↑ Digimon Frontier: "Tomoki's Lonely Battle, Asuramon's Trap"
↑ Karatenmon was adopted from a winning Digimon entry in the Second Original Digimon Contest (Digimon Web). ↑ "Iyūkusaka no Ken" is the reading used instead. This page was last modified on 22 April 2019, at 03:44.